Today is a cold rainy day, time to bust out those rainy day crafts- maybe you have a special board on pinterest just for those “when i have time to craft days” (not that we ever really get many of those right??) But just in case you get to take a sabbath today and have some good old indoor craft time- check out my “for a rainy day” board or this fun simple project my brother (of all people!) taught me. Start with some old books- ones that are well loved always have the best character! Usually I find mine at thrift stores or garage sales for a bargain. Once you have your book (make sure it has a good depth bc we will be wanting some decent storage space inside- i suggest 1 to 1 1/2 inches thick). The next step I forgot to take a picture but it’s really self explanatory- basically we are creating a box out of a book and we want to make sure that the “walls” of the book are stable. 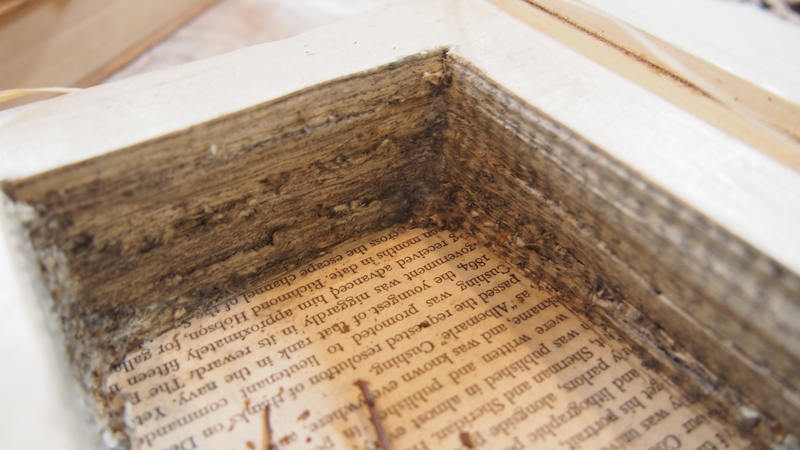 So grab your elmers glue and water it down a little, then give multiple coats the the book pages on side (that way the pages stick together and dry) you shouldn’t be able to open up any pages! Let dry overnight- should feel like a brick! Next we want to trace the “hole” we are creating in the book! I traced a smaller book and that made things simple! Whip out that exacto knife (sharper the blade the more you won’t hate this project, it can become VERY time consuming). Yep still keep carving out the center of the book…. And there is how I used my book for decor to make a cute little bird’s nest, you could also slip the book away on the shelf and hide valuable- so slyyyy.